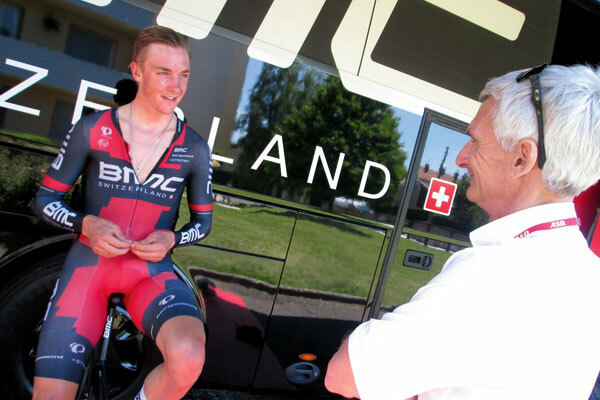 Allan Peiper, former rider, former directeur sportif at Garmin and High Road, switched teams in the close season to work with BMC. To go from the ostensibly happy-clappy freewheeling Garmin squad to the rather more troubled BMC team seemed like a weird move, but the 51 year old had good reasons. At a time when teams are looking into every detail, leaving no pebble, far less medium-sized stone unturned, Peiper was keen to look into the latest developments in training, nutrition, equipment, wind tunnel testing, “everything, down to clothing,” and make sure that these details were being fed into the team’s racing programme. While BMC is strongly rumoured to have one of the biggest budgets in the sport, from Peiper’s perspective, it was a team that had grown very quickly without necessarily having the benefit of many years of experience. Which is rather where Peiper comes in. Or rather, what Peiper has been advocating since he joined the team at the start of the 2013 season. “We made a lot of changes in the winter and we’re in the first phase of transition,” continues the Australian. “We set up a coaching performance plan which is starting to get results but, more than that I think a team of this size and ambition needs to have a clear vision of what it wants to achieve, it needs to set out goals, work out what it wants to do, then you need to work out what structures and programmes are required to make that possible and then you need to recruit a roster of riders who will enable you to meet those goals. In an ideal world, Peiper would like to still be at races, staying for a few days to talk to riders and staff to get feedback and see the team in action, gathering ideas from everyone as to how to get the best out of the team and everything that revolves around it. But, as with any organisation, change is rarely welcomed with open arms or unanimous approval. “In general it’s fair to say that change isn’t always easy to make happen, there’s usually a bit of inertia in organisations. But once you’ve overcome the inertia, once the thing is moving, then it gets much easier,” observes Peiper. The exact structure of the backroom team is still work in progress, but Peiper seems quietly confident that everyone is buying in to the need for a shake-up at the Swiss team. With a string of wins in smaller races in the second half of the season – Mathias Frank and Thor Hushovd in the Tour of Austria, Greg Van Avermaet and Daniel Oss in Wallonie and Utah, Hushovd and Taylor Phinney in Poland – that process of transition, the first phase, as Peiper puts it, looks to be on the right road. Inertia has been overcome and BMC’s momentum is building. “In Poland you could tell the team was happy and motivated,” Peiper says. “We got a hard time in the media during the Tour and it affects morale, but the wins in Poland and Austria and Belgium are changing that. I think it’s too soon to say that the changes we’re talking about have been responsible for that but a happy team and motivated riders are a good sign. “When Thor won his second stage, you saw guys staying with him on the climbs to help and when he won the sprint the other day you had guys like [Marco] Pinotti riding on the front and working in the run-in, guys you wouldn’t expect to see at the front riding on a stage like that. It’s a sign of a happy team and that’s what we need. Surely that’s further evidence of that crucial ‘feelgood’ attitude operating inside the team.